Kenzo has unveiled a new immersive retail concept, developed by its Creative Directors Carol Lim and Humberto Leon. Kenzo fans discovered the playful and futuristic experience at the brand’s new store in Milan. The new Kenzo store concept, conceived by Carol Lim and Humberto Leon, connects with the local ambiance while engaging with the worlds of creativity, technology and the future. Each new store will welcome artworks and installations inspired by the local culture in a space that resonates with the local architecture and uses local materials. Digital screens and devices stage Kenzo collections and their inspirations. The concept was unveiled at the new Kenzo boutique on via Manzoni in Milan. 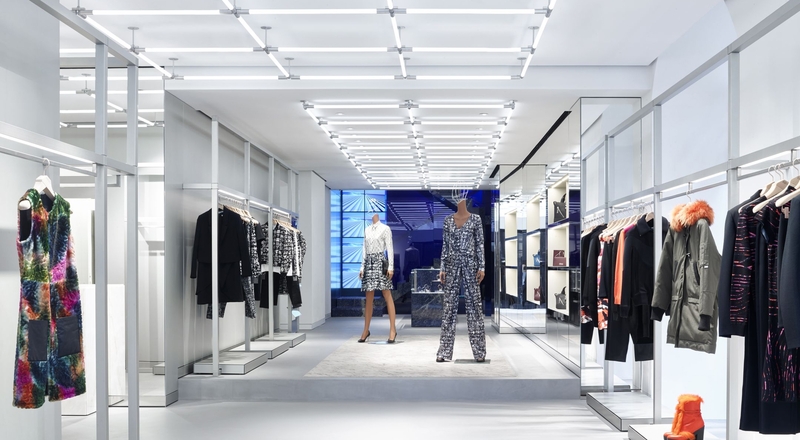 The 250-square-meter space features pristine white surfaces with alternating faux marble motifs, grids of futuristic neon lights, monolithic staircase in lapis lazuli stone colors, and aluminum racks that showcase pieces from the latest collections with an edgy touch. At the entrance, visitors are welcomed by a giant sculpture inspired by Milan’s food-loving culture, a surreal giant plate of spaghetti. Massive screens cover the walls facing mirrors to plunge visitors into Kenzo’s digital universe.